In May I visited Treblinka with a small group of Global Leadership fellows. We arrived at the extermination camp in the evening, the only people there, to silence and swarming mosquitos. 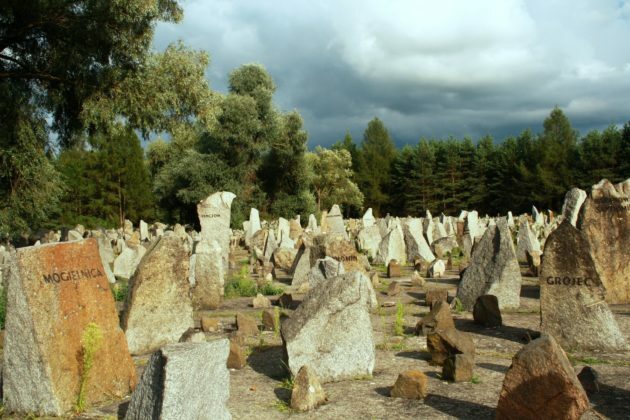 Treblinka was a gravel mine before the Nazis took it over in 1940. The pits and mounds of the tunnels are still visible, though now covered by grass. As are the train tracks that transported the gravel away, and then the humans towards. The vast field of grass is ringed with trees and interrupted every so often by enormous, right-angle stones, nearly as tall as a person. They’re jagged and imposing, seemingly placed at random along the path. Then all at once you turn a corner, the only corner past the trees, and the full scale of the memorial comes into view: 17,000 more stones, standing in clusters, with an eight-meter high monument of flat grey stone at the center. Carved across the top are terrified faces, eyes open, surrounded by other forms left featureless. Above them two hands reach upwards to the sky; a final impression of being buried alive. In the summer of 2015 I worked full time at a Holocaust Education Centre. I listened to and summarized over 120 hours of recorded witness testimony, gathered from survivors living in Canada. It was my job to find each story’s unique qualities and identify them for possible exhibitions. Polish testimonies were the most horrifying, with the most time dedicated to the camps. I would avoid transcribing them for weeks. It would take me over a year to write about the experience for Lilith’s Spring 2017 issue.